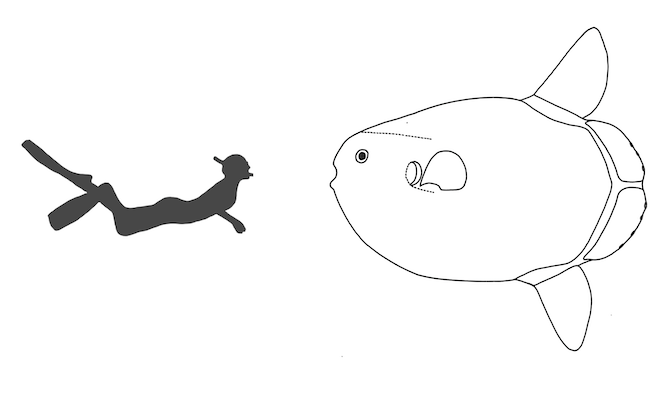 Sunfish are famous for looking odd. They are the largest bony fish in the world, can grow to over 3 metres in length and weigh up to 2 tonnes, and look a little bit like a suitcase with wings. But when I began my PhD doing population studies on sunfish off Bali in Indonesia, I didn’t expect to discover an entirely new species. What began as something of a side project turned into a four-year treasure hunt, flying thousands of kilometres to track down evidence with the help of dozens of people. As part of my PhD research, I analysed more than 150 samples of sunfish DNA. Genetic sequencing turned up four distinct species: Masturus lanceolatus, Mola mola, Mola ramsayi and a fourth that didn’t fit with any known species. A new species had been hiding in plain sight for centuries, which is why we ended up calling it Mola tecta: the hoodwinker sunfish. But back then, in 2013, we didn’t even know what they looked like; all we had were skin samples containing the mysterious DNA. The next step was trying to figure out what these fish might look like. Superficially, all sunfish look the same (that is, slightly strange). Their bodies are flat and rigid, except for their fins; they don’t have a tail; and as they grow bigger they usually develop odd bumps on their head, chin and nose. So I started looking at pictures of sunfish, especially on social media, searching for something different. I also spent a long time establishing a network of people across Australia and New Zealand who could alert me whenever a sunfish was found. I finally got a break in 2014. Observers from New Zealand and Australian fisheries were sending me pictures of sunfish they found out at sea, usually just a fin in the water. But on one occasion they hauled a tiny fish on board to free it from a fishing line, and got a brilliant photo of the whole thing along with a genetic sample. This fish had a little structure on its back fin that I’d never seen on a sunfish before. Just as I was wondering if this was a characteristic of the species, I hit the jackpot when four fish were stranded in one go on the same beach in New Zealand. I flew down to Christchurch, landed at night and drove out on to the beach. I saw my first hoodwinker sunfish in the headlights of the car – it was incredibly exciting. This changed everything, because now we knew what we were looking for. 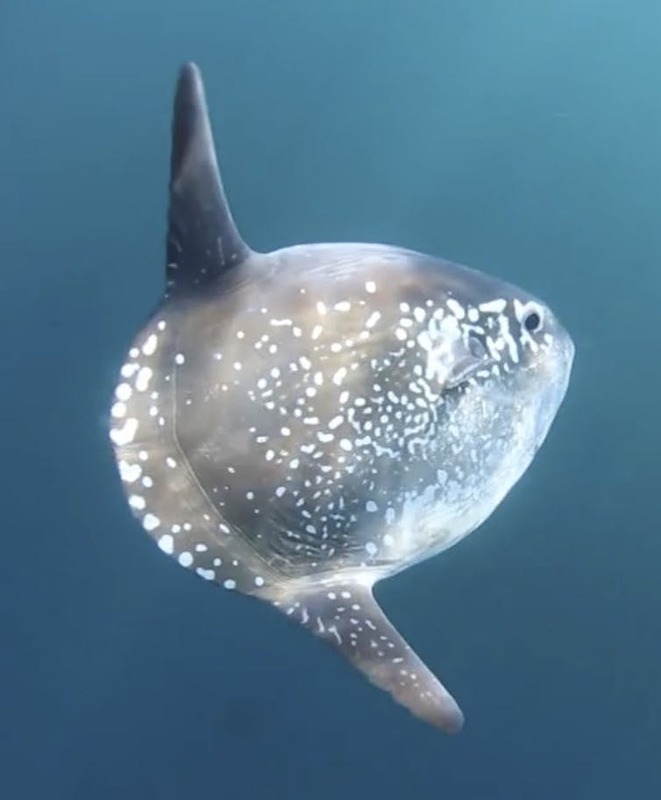 A hoodwinker sunfish off the coast of Chile. Unravelling this mystery has been a huge puzzle. Sunfish are huge, largely solitary and fairly elusive, so you can’t just go out and sample a heap of them to study. You have to fly thousands of kilometres when there’s a stranding and hope it’s the right puzzle piece you’re looking for. However, by looking at stranded specimens, photos and museum collections, and by verifying specimens genetically, we have been able to describe this species very accurately. We found enough fish to describe this species on a size spectrum of 50cm to nearly 2.5m. Unlike the other species, they don’t develop lumps and bumps as they grow; instead their body dimensions stay pretty much the same between juveniles and adults. Their back fin is separated into an upper and lower part, with a small flexible piece of skin, which we have termed the “back-fold”, connecting the halves. We don’t know exactly what their range is, but it seems to be the colder parts of the Southern Hemisphere. We’ve found them all around New Zealand (mostly around the South Island), off Tasmania, South Australia, Victoria and New South Wales (Australia), South Africa and southern Chile. Sunfish aren’t particularly rare, but it’s tricky to study them as they simply live in parts of the ocean most humans don’t go. They dive hundreds of metres to feed, and then rise to the surface to bask in the sun on their sides (hence their name). This habit of diving and rising throughout the day means they can be caught by a range of fishing gear, including tuna longlines or in drift gillnets and midwater trawls. Fishers have been turning them up for centuries. When we looked back through the literature to see if this species had been described before, we found sunfish in books that included mermen and unicorns, and one of the first written mentions comes from Pliny the Elder. Of course, this discovery didn’t happen in isolation. A group of researchers from Japan first identified the possibility of a new species from a single skin sample about 10 years ago. We were able to work with two sunfish experts from the University of Tokyo and the University of Hiroshima to describe the hoodwinker, and to compare it in detail with the other two Mola species. We also collaborated with geneticists from the Gemmell Lab at the University of Otago and expert taxonomists from the Wellington Museum Te Papa Tongarewa, who prepared and now house the “holotype”, which is the name-bearing specimen and official representative of Mola tecta. Fisheries observers from the Australian Fisheries Management Authority and the New Zealand Ministry of Primary Industries have sent me around 120 samples from sunfish they sampled while on patrols, which was the basis for the initial study. After four years of work – and the help of many people – it’s great to be able to finally share the hoodwinker sunfish with the world! 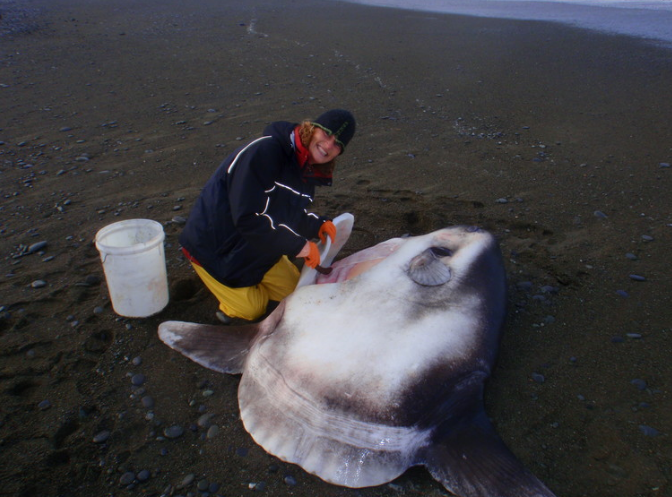 Image: A beached hoodwinker sunfish, the new species described by researchers from Murdoch University.